Two broad theories try to explain ocean trenches, earthquakes, and the Ring of Fire: the hydroplate theory, and the plate tectonic theory. Each explanation will be given as its advocates would. Then, we will test these conflicting explanations against observations and the laws of physics. Figure 85: Hydroplate Explanation for Trenches. (A) Before the flood, the weight of rock and water, pushing down on the subterranean chamber’s floor, balanced the floor’s upward pressure. The rupture destroyed that equilibrium. Directly below the rupture, the imbalance grew as escaping, high-velocity water and the 60-mile-high, unsupportable, crumbling walls widened the globe-encircling rupture hundreds of miles. Eventually, the imbalance overwhelmed the strength of the floor. First, the Mid-Atlantic Ridge buckled, or sprang, upward. As Europe, Africa, and Asia slid eastward and the Americas plate slid westward (based on today’s directions), weight was removed from the rising floor, causing it to rise faster, accelerating the hydroplates even more. Pressure directly under the floor, represented by the large black arrows, naturally decreased as the floor rose. Magma’s Compressibility. Magma (melted rock inside the earth) is more compressible than the solid rock from which it came.2 Rock that melts under the extreme pressures more than 220 miles below the earth’s surface will contract! At depths of about 220 miles, melted rock occupies nearly the same volume as the original rock. At atmospheric pressure, rock expands by 7–17% (depending on the minerals present) when it is heated and melts. The density where the rock’s volume does not change as it melts is called the crossover density. Again, it depends somewhat on the minerals present. Because of magma’s compressibility, magma below this depth of about 220 miles is too dense to rise, so magma cannot circulate inside the mantle,19 contrary to what has been taught for 50 years! Figure 86: Crossover Depth. This graph shows how the density of liquid rock (magma) changes with depth below the earth’s surface. 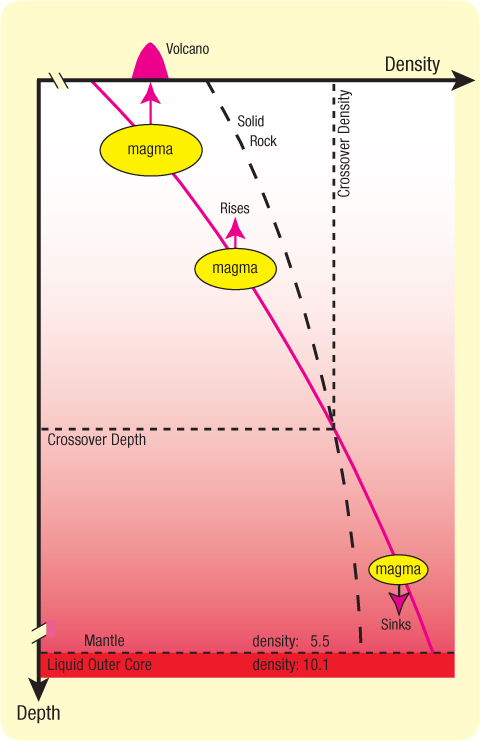 Above the crossover depth, magma is less dense than solid rock at the same depth and will try to rise through the cracks where the magma was produced by sliding friction; below the crossover depth, magma is denser than solid rock and will sink along those cracks toward the liquid outer core. Magma that drains down into the liquid outer core becomes almost twice as dense as the solid rock at the base of the mantle. [Note, at the bottom of the figure, the contrast in density (5.5-to-10.1) between the mantle and liquid outer core, and see the highlighted red cells on page 621.] Therefore, the mantle cannot circulate. Earth’s magma began to be produced during the flood. [See "Melting the Inner Earth" on pages 620–623.] The magma’s final volume was more than 120 times greater than all the water in today’s oceans! With so much more liquid rock inside the earth than liquid water on earth, we need to understand how magma forms and why it moves. Where Did All the Magma Go? The denser (deeper) magma and the denser unmelted minerals in the magma slowly drained into what grew to become earth’s outer and inner cores, respectively. The less dense magma that formed above the crossover depth tended to escape upward to the earth’s surface as volcanoes or flood basalts. For years after the flood, most eruptions spilled onto the Pacific floor—a floor littered today with 40,000 volcanic cones, each taller than 1 kilometer! The following analogy explains why. A Cable Analogy. Imagine a long, unbreakable cable passing through the center of the earth before the flood. One end is anchored to the portion of the subterranean chamber floor that will rise to become the floor of the Atlantic Ocean. 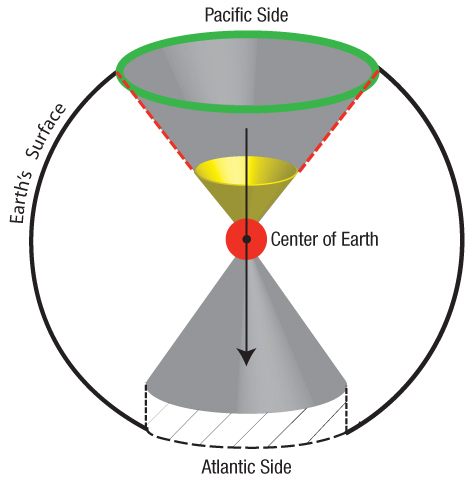 The other end attaches to the Pacific plate on the opposite side of the earth. When the Atlantic floor is forced upward at the end of the flood, the Pacific floor will be pulled down. Gravity produces the same effect as our imaginary cable. Gravity creates so much compression deep inside the earth that voids cannot open up; rock is always squeezed against rock (including melted rock). However, compressed rock can shear. For example, if a heavy weight is on top of a deck of cards lying on a table, space cannot open up between the cards, but a relatively small horizontal force can cause a card to slip (or shear) relative to an adjacent card. Friction from shearing and deformations deep in the earth always melts the sliding surfaces. The magma produced then lubricates those surfaces, so they slip more easily. Shearing. Now let’s imagine many evenly spaced cables connect the rising Atlantic floor to the broader, subsiding Pacific plate. (The upward pull from the rising Atlantic floor widens with depth;21 this is why the Pacific has a larger area than the Atlantic.) These cables shorten by varying amounts, because of variations in frictional heating along their lengths and magma’s compressibility. The farther a cable segment is from the Atlantic floor, the more likely it will move at a different rate than a corresponding segment on an adjacent cable, thereby shearing the rock between them, and produce magma. Each segment’s movement is the cable’s net expansion (or contraction) between the segment and the Atlantic floor. Therefore, the farther a segment is from the Atlantic floor, the more likely shearing becomes. Thus, shearing and magma production are extreme in and under the Pacific plate. Large shearing offsets that reached the Pacific floor formed ocean trenches. Benioff zones under trenches are shearing surfaces (fault planes), not subducting plates, as commonly taught.22 Island chains often formed where magma escaped upward along these cracks. The Hawaiian Islands and the Emperor Seamounts are prime examples. Deep Movements during the Flood Phase. As subterranean water escaped during the flood phase, the rupture steadily widened. This removed more and more weight from the chamber floor directly below, so that portion of the floor increasingly bulged upward. 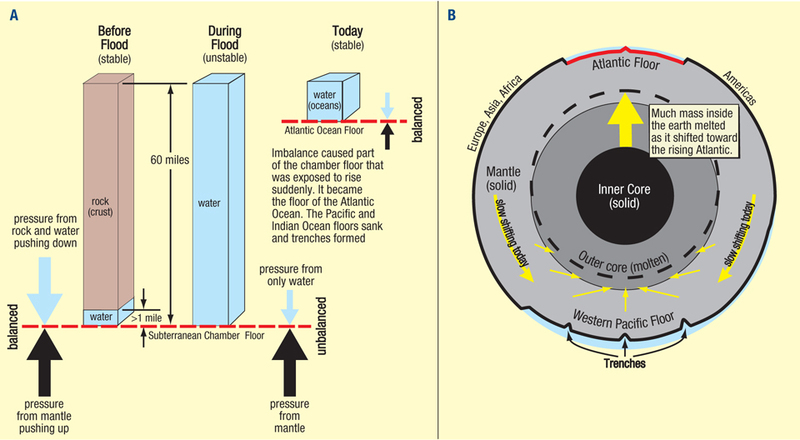 For a while, two types of forces resisted the rising of what would become the Atlantic floor: (1) the strength of the rock between that floor and the Pacific side of the earth, and (2) the weight of the stationary hydroplates that still lay above most of what would become the Atlantic floor. Fractures and melting occurred deeper and deeper beneath the bulging chamber floor on the Atlantic side. Magma produced below the crossover depth contracted, so deeper fracturing, melting, and contraction occurred at an accelerating rate. By the end of the flood phase, the Pacific plate’s sagging foundation had fractured in millions of places, and the magma generated along the deep sliding surfaces instantly contracted. Therefore, the Pacific plate, lacking support, rapidly subsided and sheared around its perimeter—now called the Ring of Fire. This shearing suddenly increased the upward pressure under the rising Atlantic floor, so the hydroplates began to accelerate away from the rising Mid-Atlantic Ridge. That also removed weight from above the Atlantic floor, so it rose even faster. Because so much compressible magma was quickly produced under the Pacific plate, that plate subsided (caved in) faster than the Atlantic floor rose. In hours, the downhill slope on which the hydroplates slid steepened, and the sheared Pacific Basin, surrounded by the Ring of Fire, became so deep that the hydroplates, sliding away from the rising Mid-Atlantic Ridge, met no major obstacles. After the flood, magma under the Pacific floor, but above the crossover depth, erupted onto the Pacific floor. (To a much lesser extent, eruptions continue today, temporarily raising ocean temperatures in the western Pacific, a phenomenon called El Niño.14 ) Magma below the crossover depth drains down into the outer core, so the outer core is slowly growing today! Simultaneously, melting is shrinking the total volume below the crossover depth, so the crust must be compressing like the wrinkling skin of a drying (shrinking) apple. Also, continents, thickened during the compression event, are still sinking into and laterally displacing the mantle. Therefore, the mantle is being squeezed downward from above and upward by the growing outer core. 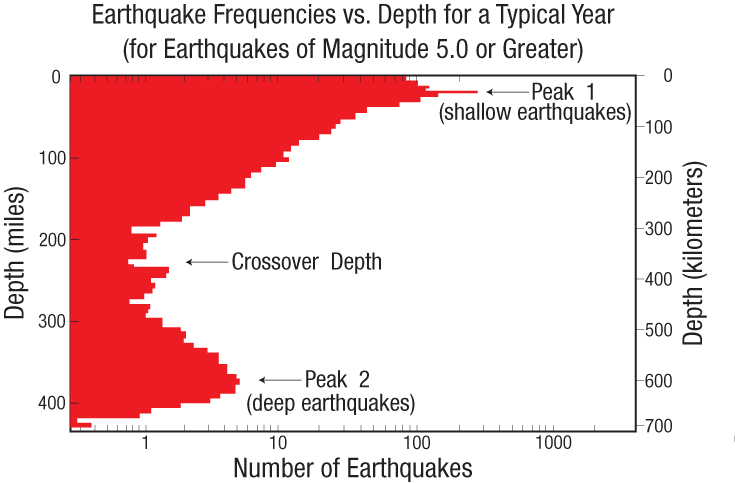 Mantle volume is also being lost primarily from the Pacific mantle by draining below the crossover depth and by eruptions above the crossover depth. Therefore, the mantle is shifting an inch or so a year, generally toward the Pacific, to replace that escaping volume. [See Figure 94 on page 173.] These movements and stresses produce earthquakes. Slowly shifting continents led to the mistaken belief that the entire solid mantle somehow circulates as if it were a liquid—and, over millions of years, drifted continents over the face of the earth. Rapid Cooling. Some claim that if magma spilled out only about 5,000 years ago, heat would still be present. The lack of heat, they assert, shows that millions of years have elapsed. They have overlooked that magma’s contents: (a) crystals of unmelted minerals with high melting temperatures, (b) rock fragments, called xenoliths (ZEN-oh-liths), dislodged by the violent shearing and crushing, and (c) water absorbed by magma rising up through what remained of the subterranean water chamber. (This is why volcanoes emit so much water vapor; typically 70% of all gas released by volcanoes is water vapor.25) Because water dissolved in magma lowers its melting temperature, the magma remained a liquid at temperatures below the rock’s normal melting temperature. Also, the solid rock fragments in the magma absorbed heat, so the magma quickly cooled and solidified. The continental-drift phase began with hydroplates sliding “downhill” on a layer of water, away from the rising Mid-Atlantic Ridge. This removed more weight from the rising portion of the subterranean chamber floor, lifting it faster, and accelerating the hydroplates even more. As that part of the chamber floor rose to become the Atlantic floor, it stretched horizontally in all directions, just as a balloon stretches when its radius increases. This stretching produced cracks parallel and perpendicular to the Mid-Oceanic Ridge, forming the overlapping spreading centers shown on pages 115 and 145. Rising began in the Atlantic, so the Mid-Atlantic Ridge and its cracks are the most prominent of the oceanic ridge system. The rising Atlantic floor pulled even deeper material upward. Within the inner Earth, material shifted toward the rising Atlantic floor, a broader, but initially shallow, depression formed on the opposite side of the Earth—the basins of the Pacific and Indian Oceans. Just as the Atlantic floor stretched horizontally as it rose, the western Pacific floor compressed horizontally as it subsided (sank). The slope between the upward bulging Atlantic floor and the subsiding Pacific floor steadily increased. (Figure 50 on page 117 shows one small, but telling, “snapshot” of what followed.) The instability that triggered the continental-drift phase was like that of a large, flat rock resting in the center of a horizontal teeter-totter. Slight imbalances (such as variations in the width of the rupture during the flood phase and the shifting of water from the Atlantic side to the Pacific side) will slowly tip our teeter-totter. A tipping point will be reached where the rock will rapidly accelerate downhill, so the tipping will increase even more. Although the Earth departed significantly from a spherical shape, gravity restored most of that spherical shape in the following months and years. A simple, classic experiment illustrates some aspects of this event. Figure 88: Trench Cross Section Based on Hydroplate Theory. Notice that the trench axis will generally not be a straight line. Sediments (green) hide the top of a fault plane that would otherwise rise a few hundred feet above the floor. Other sediments (not shown) and flood basalts (dark gray) cover most of the western Pacific floor. The three large black arrows show the direction of the rising Atlantic and the forces that downwarped the mantle and the Pacific plate. Earthquakes occur on the many faults produced, especially in Benioff zones and at low tides. Most volcanoes are not above Benioff zones, but are near a myriad of other faults near the center of the western Pacific, where there was considerable downwarping and shearing. High-pressure deformations inside the Earth produced faulting and, therefore, extreme friction—and heat. To appreciate the heat generated, slide a brick one foot along a sidewalk. The brick and sidewalk will warm slightly. Sliding a brick an inch but with a mile of rock squarely on top would melt part of the brick and sidewalk. Earth’s radius is almost 4,000 miles. Place a few thousand of those miles of rock on top of the brick and slide it only one thousandth of an inch. The heat generated would melt the entire brick and much of the sidewalk below. Small movements deep inside the solid Earth, even microscopic, puttylike deformations, melted huge volumes of minerals. This released the water locked within the crystalline structure of certain minerals. The fact that there are two peaks—one 22 miles (35 kilometers) below the earth’s surface and the other at 370 miles (600 kilometers) below—tells us that two types of earthquakes occur, each at a different depth. The hydroplate theory explains both conditions and why conventional geophysics does not explain the root cause of earthquakes. Shallow earthquakes (above depths of 220 miles) involve only brittle fracture and sliding friction.42 However, cracks or space should not open up to allow movement for deep earthquakes where pressures are extreme. Geophysicists have tried for more than 80 years to explain why earthquakes occur at 220–410-mile depths .43 Those rocks should be so hot that they would not break, but would deform like hot tar—slowly and quietly.Those earthquakes occur where pressure and heat should cause rocks to deform and flow before enough stress can build up to cause failure. How then do deep earthquakes occur? Figure 90: Strange Displacements during the 9.0 magnitude, 11 March 2011 Japanese Earthquake. The Japanese government, using the Global Positioning System (GPS), continuously measures the location of 1,200 points to an accuracy of better than an inch. Each arrow above shows the direction and distance that a point on the ground moved during that earthquake. Some points moved 18 feet (5.5 meters)! 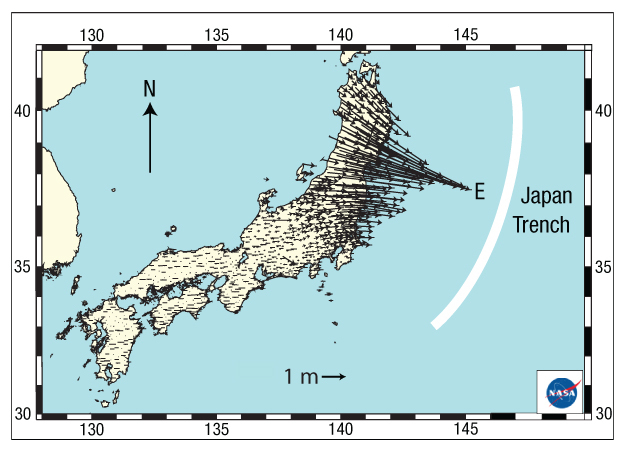 Horizontal movements appear to converge toward the epicenter, Point E. The actual earthquake began at the focus, 20 miles below Point E (below the earth’s surface), on the fault (the Benioff zone) that descends from the Japan Trench—down and to the west, under Japan. If frictional heat steadily “soaks” into the rock on both sides of a fault, magma droplets will increasingly form, so sooner or later, leakage will begin. Paths will open up for the expanding melt to escape upward buoyantly. The highly compressed solid “scaffolding” (surrounding the focus and composed of minerals with the highest melting temperatures) will become unstable and eventually collapse. Frictional heating will instantly become extreme, so all nearby minerals will suddenly melt. The result: a powerful earthquake. What Causes Earthquakes, and Can They Be Predicted? Earthquakes are the deadliest of today’s natural disasters. Each day, on average, earthquakes kill 78–500 people and destroy about $500 million in property.55, 56 Current scientific understandings do not fully explain earthquakes, so a better paradigm is needed. Everyone agrees that an earthquake is a sudden slippage along a long, preexisting fracture—a fault—inside the Earth. Much greater forces and energy are required to produce those fractures than the slippage, so any explanation for earthquakes must first explain the fractures. What produced the preexisting fractures? The plate tectonic theory doesn’t tell us how those fractures occurred, but only tries to explain earthquakes that occur at plate boundaries when plates rub against each other. How plates and their boundaries formed is never explained, but, as Figure 89 on page 161 shows, most earthquakes occur not at plate boundaries, but on faults inside or below plates. During the flood, gigantic shifts of mass produced thousands of fractures through Earth’s crust and mantle. These shifts included: the deposition of a mile-thick layer of sediments on the continents, the uplift of the Atlantic floor and the corresponding subsidence on the Pacific side of the Earth, rapid continental drift, the compression event that pushed up major mountain ranges in less than an hour, and as explained on page 164, melting at Earth’s center that produced a 50% shrinkage of the inner Earth that is now Earth’s core. What causes slippage on a fault? Most earthquakes occur when forces parallel to and on opposite sides of a lubricated fault differ enough. Migrating liquid within the Earth lubricates faults, initiating slippage. The liquid can be some of the remaining preflood subterranean water or magma produced by frictional heat that melted rock. Frictional heat generated by slippage along a fault increasingly melts, deep within the walls of the fault, mineral grains with the lowest melting temperatures. Above the crossover depth, the liquid droplets expand and stretch the surrounding rock; below the crossover depth, the droplets shrink, so the surrounding rock is collapses and is compressed. As frictional heating increases, more magma droplets form, merge, and eventually escape along faults.60 The surrounding rock may then collapse as an earthquake. Magma draining from between mantle blocks and into the core opens up space, so the continents slowly shift, as shown in Figure 90 on page 161. Notice that this movement is not caused by the rock-solid mantle (84% of Earth’s volume) magically circulating, as incorrectly taught to generations of students. It is caused by magma draining along faults within the mantle—faults produced during the global flood. When you finish Part II of this book, you should have an understanding these researchers currently lack. Their main difficulty is not the physics of the process or an acceptance of all the supporting evidence. Their difficulty will probably be an unwillingness to consider a global flood and a new scientific paradigm. Professor Wendy Mao, a mineral physicist at Stanford University, has duplicated the pressure-temperature conditions 125 miles (200 kilometers) below the earth’s surface. She compressed a tiny piece of silicate rock that was mixed with an iron-rich alloy. Then, she heated the sample to 3,300°F (1,800°C) and, with a series of x-rays, produced a three-dimensional image. The iron melted and became tiny spherical droplets encased in a solid silicate matrix.69 They looked like bubbles in a block of ice. What can we conclude? If no more heat is applied, the mixture will be stable. The trapped liquid will support the solid “scaffolding,” just as trapped liquid in a waterbed can support a person lying on top—and, before the flood, trapped, high-pressure liquid in the subterranean water chamber helped support earth’s crust. Today, very slight amounts of slippage frequently occur along thousands of faults in the crust and mantle, especially where faults extend from a trench down through the entire mantle to the growing liquid foundation of the outer core. If, instead of a solid foundation, your home rested on a dense liquid foundation, you can imagine how cracked the walls of your house would be if ripples sometimes pulsed through the liquid or if that foundation slowly rose by the steady addition of dense liquid. Slippage would frequently occur along the weakest cracks in the walls. Within the mantle, slippage along faults produces more magma, most of which drains into the outer core, adding to its volume and causing more uplift, slippage, and ripples. The mantle is unstable. The mantle is essentially solid, so even below 410-mile depths the same slippage produces friction and heat. Why then do earthquakes not occur below 410 miles? At those great depths, when heating along faults melts minerals with low melting temperatures, the droplets shrink even more, so their individual encasements collapse more and experience further frictional heating. That, plus the higher temperatures at those depths, weakens and collapses the scaffolding before leakage can occur. Because these deformations are plastic, no earthquakes occur below 410-mile depths. PREDICTION 8: By 2020, satellites in low-earth orbits will predict the location of major earthquakes several days beforehand. They will do this by measuring electrical changes in the ionosphere that are produced by piezoelectric voltages building up in stressed rock around the focus of the coming earthquakes. If the focus is above the crossover depth, which is 220 miles below the earth’s surface, upward escaping magma may also produce detectable heat around the epicenter days beforehand. Suppose the inner Earth initially had a more uniform mixture of minerals. Heating would first melt minerals with lower melting temperatures, which would allow denser grains to settle and lighter grains to rise, a process called gravitational settling. This would generate much more heat and produce more faulting, melting, and gravitational settling. After many such cycles, the Earth’s core would form with solid, denser minerals (containing iron and nickel) settling to form the inner core and the melt forming the liquid outer core. Shifting so much mass toward the center of the Earth and doubling the density of the rock melting below the crossover depth would increase Earth’s rotational speed, just as the skater in Figure 84 on page 156 spins faster as she draws her arms closer to her spin axis. With the collapse of the deepest foundations on the Pacific side of the earth, a runaway situation quickly developed in which deep shearing, frictional heating, and shrinkage produced more shearing, frictional heating and shrinkage. The shrinkage within the yellow cone region caused the sides of the gray Pacific cone (marked by the dashed red line) to shear. This produced the Ring of Fire, shown in green, and dropped the Pacific plate at least 30 miles. Simultaneously, the Atlantic floor rose. In this simplified (not to scale) illustration, assume that all movement was in the general direction of the long black arrow and confined within the two gray cones whose apexes met at the center of the earth. Obviously, runaway melting began near the center of the earth, where pressures and deformations were greatest. Had the earth ever been molten, we should not find dense nonreactive minerals (such as gold) at earth’s surface; those minerals would have settled into the core. Other problems with this explanation are given in “Molten Earth?” on page 30. So how did earth’s core form? As the rupture widened during the flood, the floor of the subterranean chamber suddenly bulged upward under the entire length of the 46,000-mile-long rupture (as shown in Figure 63 on page 130 and Figure 65 on page 131). At the center of the earth, where pressures are extreme and stresses and movements are focused, frictional melting began. Pressures are so great near the earth’s center that even slight movements between adjacent molecules produce heating, melting, and (as explained on page 159) shrinkage. This was the beginning of the earth’s core. Crystals with lower melting temperatures melted first. The magma produced then surrounded other crystals, shielding them from further shearing stresses and frictional heating. As recent discoveries have confirmed,39 the denser, unmelted crystals settled through the melt, producing a solid, but squishy inner core. This is why a “giant crystal” is at the center of the Earth and why earthquake waves travel much faster through the inner core along “the axis of the magnetic poles” than in the perpendicular direction.31,32 Crystals less dense than the melt floated to the top of the melt and pressed against the bottom of the mantle. This is the origin of the ultralow-velocity zone, the 200-km-thick D" layer at the base of the mantle. Seismic waves travel more slowly through D", because it consists of slushy, magma-saturated sediments. Material melting near the center of the earth (far below the crossover depth) shrank, producing even more plastic deformation and melting in the rock immediately above. For a time, runaway melting occurred, especially on the Pacific side of the earth. Throughout the flood, the chamber floor increasingly bulged upward, producing fractures that grew deeper as the rupture widened. Eventually, deep shear fractures connected with the growing outer core. Those drainage channels remain today for magma (produced below the crossover depth) to drain down into the outer core. As will soon be explained, these deep channels play a key role in earthquakes, earth’s magnetic field, and the slow shifting of the continents. Misunderstanding the cause of these shifts led to the erroneous theory of plate tectonics. Shrinking Earth. The liquid outer core has a volume of 4.1 × 1010 miles3 (1.7 × 1011 km3)—7.7 times the volume of our moon. The outer core’s density is almost twice that of the mantle rock from which it came. Therefore, before the core formed, the preflood Earth’s volume was almost 4.1 × 1010 miles3 greater, so the Earth’s radius was about 180 miles larger than today. The Earth shrank. Undoubtedly, most of this shrinkage occurred during and soon after the flood, as the mantle lost about twice the volume that the dense core gained. Earthquakes still occur, so the Earth is still shrinking, because slight amounts of relatively low density mantle rock below the crossover depth are still becoming high density magma draining into the outer core. Can this shrinkage be measured? Marginally. The best (and highly impressive) measurements in changes of the Earth’s radius were conducted in 2000 and 2005 by the International Earth Rotation and Reference Systems Service in Paris, France,44 using seventy stations around the world. Those measurements (based on Satellite Laser Ranging, Very Long Baseline Interferometry, and the Global Positioning System) showed a 0.2 inch (5 millimeters) shortening of Earth’s radius during those 5 years. However, more accurate techniques were used in 2005, so the shortening may be due to improved accuracy. Future measurements should clarify the amount of shrinkage. Before plate tectonics became popular, some geologists said that many of the Earth’s surface features were a result of past shrinkage deep within the Earth.45 Among the many crustal features they felt this would explain were ocean trenches, tablemounts, and the dropping of the Pacific Basin as one huge block. Most of those geologists believed that a molten Earth shrunk as it cooled over millions of years. However, because they could not provide convincing details, their idea has fallen into disfavor. [The belief in a molten Earth can be easily rejected. See “Molten Earth” on page 30.] Nevertheless, the idea of millions of years has remained in most people’s imaginations. PREDICTION 9: The mean radius of the Earth has shrunk about 180 miles since before the flood. Earth is still shrinking, but at a much slower rate. While these geologists did see evidence of shrinkage, they were reasoning only from the effects they saw back to possible causes. Had they also arrived at a consistent picture by reasoning from cause to effect and not been satisfied until the forces, energy, and mechanisms were understood, they would have been on firmer ground. Figure 92: Andesite Line. This sharp discontinuity (shown in red) in the western Pacific was identified in 1912 by the famous New Zealand geologist, Patrick Marshall. 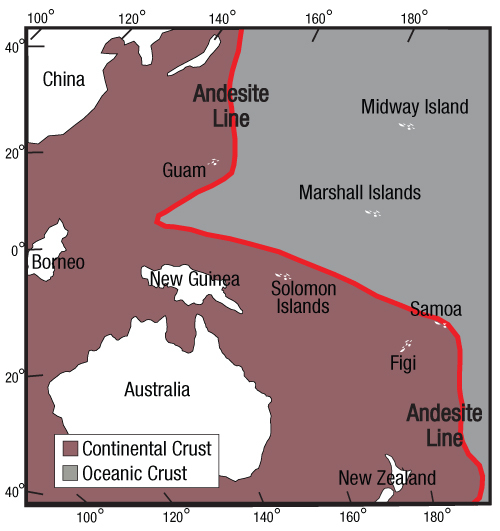 The andesite line is considered “the most significant regional geologic distinction in the Pacific Ocean Basin,”96 although the term andesite line has fallen into disuse among plate-tectonic advocates. Volcanic islands to the east of the andesite line are basaltic, while islands to the west are made of andesite, a type of rock named for its presence in the Andes Mountains. Andesite contains minerals, such as hornblende and biotite, that are not in basalt but are in granite (continental rock). Despite its significance, geologists have never explained why continental crust lies below the western Pacific. Both the hydroplate theory and the plate tectonic theory are explained as their advocates would explain the theories. One should critically question every detail of both theories, and not accept either until all available evidence has been considered. The Plate Tectonic Theory. 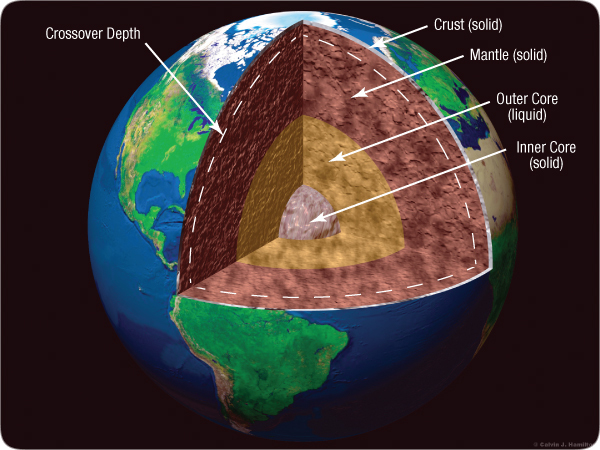 Earth’s crust is broken into rigid plates, 30–60-miles thick, some with an area roughly the size of a continent. Some plates carry portions of oceans and continents. Plates move relative to each other over the Earth’s surface, an inch or so per year. 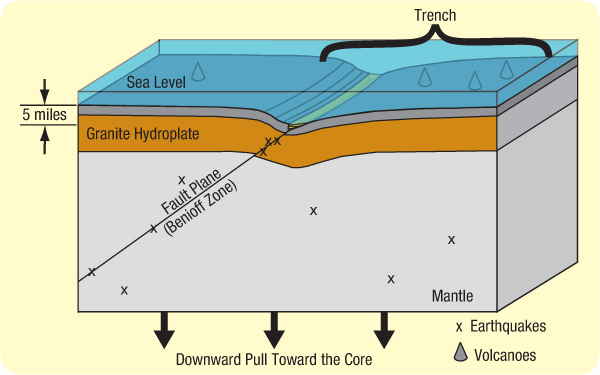 Figure 93: Plate Tectonic Explanation for Trenches. Internal heat circulates the mantle, causing large plates to drift over the earth’s surface. Consequently, material rises at oceanic ridges, forcing the seafloor to spread, so plates must subduct at ocean trenches, allowing layered sediments, shown in yellow, to collect. Earthquakes usually occur where plates subduct (Benioff zones) and at other plate boundaries. Subducting plates also melt rock, and the resulting magma rises to form volcanoes. Trenches formed and plates move by heat from radioactive decay. Just as hot water circulates in a pan on a stove, hot rock circulates slowly inside Earth’s mantle. Radioactive decay warms some parts of the mantle more than others. The warmer rock expands, becomes less dense (more buoyant), and slowly rises, as a cork rises when submerged in water. Sometimes, plumes of hot rock rising from the outer core break through the Earth’s crust as flood basalts. Conversely, relatively cold rock descends. Rising and descending rock inside the mantle forms circulation cells (convection cells) which drag plates forward. Currents within the mantle rise at oceanic ridges, create new crust, and produce seafloor spreading. Because new crust forms at oceanic ridges, old crust must be consumed somewhere. This happens wherever two plates converge. The older plate is denser, because it had more time to cool. Therefore, it sinks below the younger plate and subducts into the mantle, forming a trench. A cold, sinking edge will pull down the rest of the plate and enhance circulation in the mantle. Earthquakes occur under trenches when subducting plates slip along Benioff zones and when plates slip past each other. At great depths, subducting plates melt, releasing magma, which migrates up to the Earth’s surface to form volcanoes. Most of the Ring of Fire is produced by subducting plates. Such slow processes require hundreds of millions of years to produce what we see today.